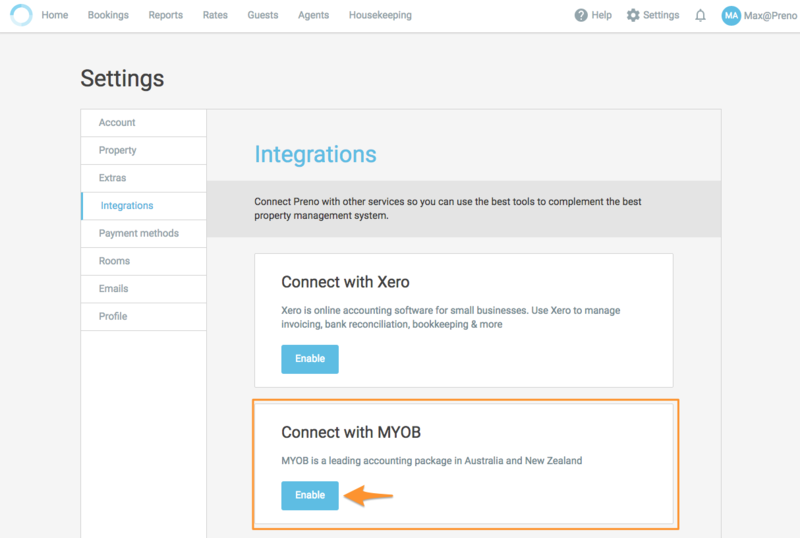 Preno integrates with MYOB to automate invoicing and reduce double handling. This guide explains how to configure, to ensure the information flows correctly. 2. A window with MYOB will open. It will ask you to login into your MYOB account if you are not logged in yet. 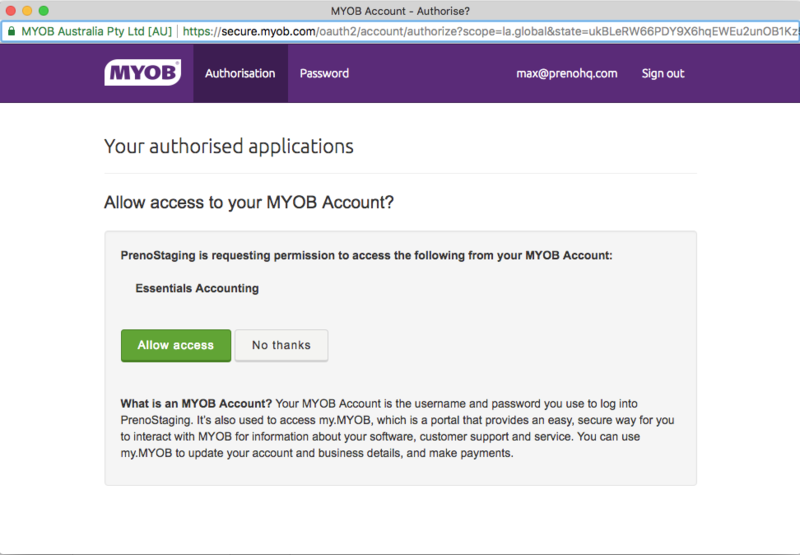 After that a page will open asking you to give Preno permissions to access your MYOB account. You'll need to click "Allow access"
3. Once Preno is able to connect to MYOB, you will need to configure the connection. 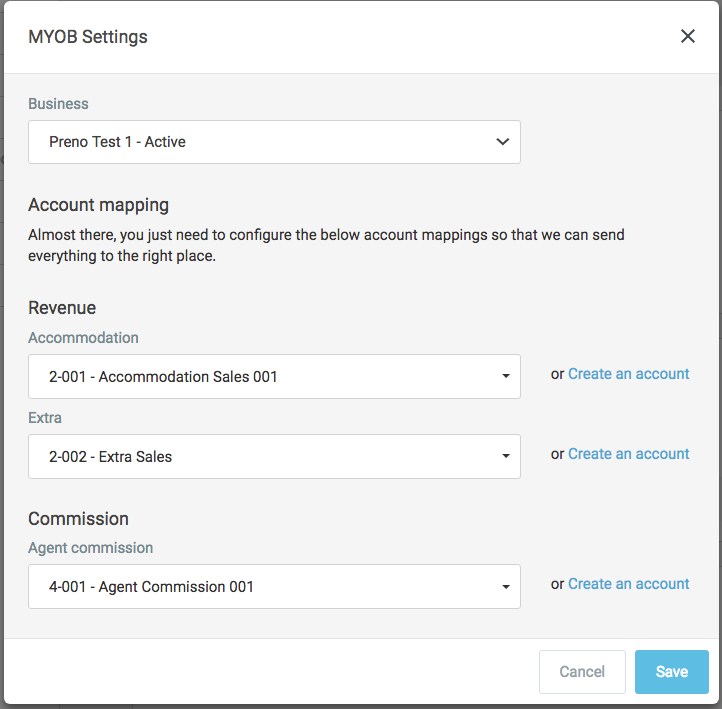 Preno requires you to map your accounts in MYOB to your accounts in Preno. It's important to get this right. Different accounts have different effects on your financial statements in MYOB. Accommodation: This revenue account records the total amount of a booking on checkout. Only revenue from nightly stays will be recorded in here. This is a revenue account with GST. Extras: Preno will record the revenue from the sale of extras in this account. It's separate from the Accommodation account for reporting purposes. This is a revenue account with GST. Agent Commission: This is an expense account. When you invoice an agent for your guest's stay, Preno automatically deducts the agent's commission and puts it in this account. This is an expense account with GST. Missing an account in MYOB? Preno can create the account you need too. On the right hand side of the drop-down, click Create an Account. Pick the code and name you like, and you're ready to go! We'll pick the right account type. This is important to get right! We really recommend getting in touch with your accountant to make sure that your accounts are mapped and set up correctly.